The Philhealth coverage for RADIOTHERAPY is 3,000 pesos per session. Every Philhealth member is given a treatment allowance of 45 days per calendar year (from January to December). One radiotherapy session is equivalent to 1 day deduction from the 45-day allowance. If radiotherapy is done during confinement, whether in the same medical facility or not, it is the number of confinement days, not the number of radiotherapy sessions, that is deducted from the 45-day allowance. Outpatient radiotherapy is excluded from the 90-day single-period-of-confinement rule. It can be availed of on a per session basis, regardless of the number of days between sessions. 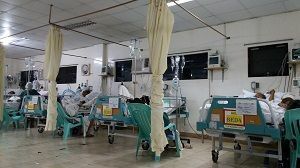 The dependents of a Philhealth member are given a treatment allowance of 45 days. The dependents share with one another the 45 days. For example, the 3 minor children of a Philhealth member will share the 45 days among themselves.